Kyiv Commercial Institute (Київський комерційний інститут; Kyivskyi komertsiinyi instytut). A higher school of commerce and economics in Kyiv founded in 1906 by Mytrofan Dovnar-Zapolsky as the Higher Commercial Courses and converted into an institute in 1908. Its charter was approved by the government in 1912. The institute consisted of two departments—commerce and technology, and economics—and a number of subdepartments such as railroads, insurance, banking, and pedagogy. It had laboratories, a museum, and library. Its director was M. Dovnar-Zapolsky, and many of its faculty were professors of Kyiv University or Kyiv Polytechnical Institute. It published its own scientific proceedings. In 1914 the enrollment was 4,000. Each year about 30 students were sent abroad for practical research. 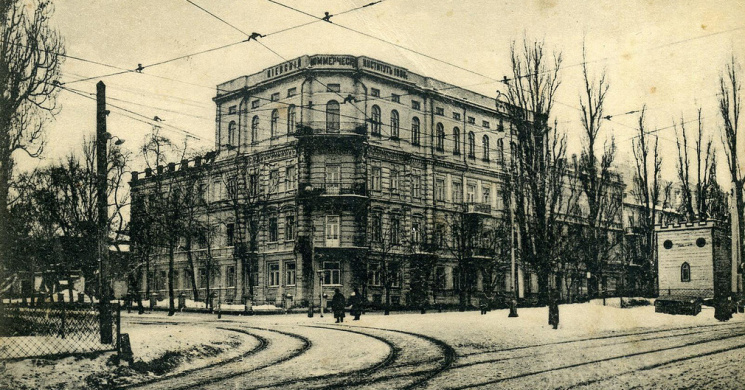 In 1920 the institute was reorganized into the Kyiv Institute of the National Economy.